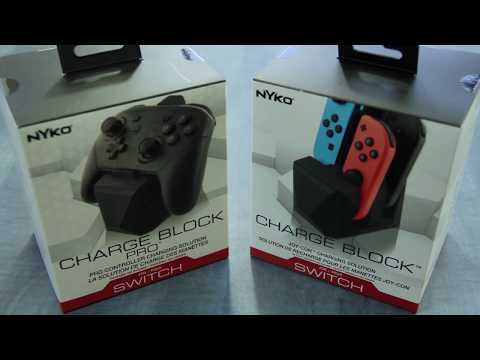 Conveniently store and charge your Nintendo Switch™ Pro Controller with Nyko's Charge Block Pro for Nintendo Switch™. The Charge Block Pro for Nintendo Switch utilizes Nyko's patented dongle system that attaches to the USB Type-C™ port on the controller leaving the ergonomics and grip of the Pro Controller unchanged. This allows for easy drop and charge functionality - no additional cords, wires or plugs needed. Connect multiple Charge Blocks together from multiple platforms to create your own custom charger*. No more low battery alerts during extended gaming sessions. The low-profile design allows for the Charge Block to fit easily in most entertainment centers while the pass-through charge indicator on the top of the dongle keeps you notified of the charging status.